The Drum Fest International Drum Festival has a long-standing tradition in Poland as this year marks its 26th anniversary. 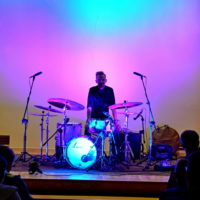 Every year in autumn, there is a lot going on: concerts, workshops, competitions, solo recitals – all things connected with drums and drumming. 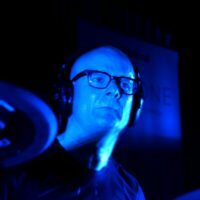 Between October 6 and 8, 2017, there was quite an intensive Drum Fest weekend. All the events took place at the Frederic Chopin Music School in Opole, Poland. All those who attended the event had a great opportunity to see and listen to great artists who were performing for them. The Young Drum Hero contest was the ultimate test for the younger skinsmen, and they all did geat job! 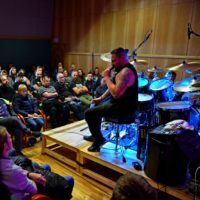 The drummers who took over that weekend were: notable sideman, session musician and educator Russ Miller, great Polish extreme metal export Dariusz “Daray” Brzozowski, Polish live and studio ace as well as educator Maciej Gołyźniak, and two great drummers and Roland endorsers – Mariusz Mocarski and Michael Schack. This is not the end of the list. Among the performers was also the legendary extreme metal drummer George Kollias, whom we had a nice chat with the day after his workshop. Enjoy this interview! 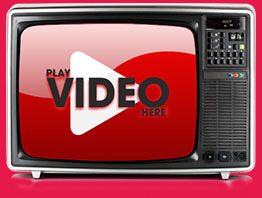 “I was impressed and inspired by the participants of the Young Drum Hero contest. Really inspired. I’m not saying it to support the contest. Watching young drummers going up there and killing it and performing the best they can. I know they were stressed out, I know they couldn’t use their own drum sets. It’s a big deal and hats off to everybody who was a part of it. I was very impressed, especially by some of the drummers, which is normal. The 10-year-old guy [Mikołaj Siciak] – insane! I hope to meet him later and give him a little extra push to inspire and help him. I think you’re about to witness a great drummer in a few years. And many other people. The two ladies [Dagmara Karandys, Natalia Krząkała] were amazing! A few more guys, the variety of styles… I loved how some of them covered different styles as well. They played a pop tune and then a jazz tune. I had a lot of fun at my clinic yesterday. I really, really enjoyed it. Sometimes, you go up there and you do your job. For me, it always has to be fun. It almost always is fun, but yesterday was a little bit extra fun just because I had a warm welcome and a great day. I got so inspired from watching drummers playing all day that I was looking forward to playing. Unfortunately, I didn’t spend all the time I need setting up the kit so I had minor difficulties, but I had great fun. I loved it! I want to show those who come to my clinics that we’re not only about speed for what I do. It is fast, aggressive music, but there’s a lot of groove and great drumming in there. It’s the music that drives the drummer. We call it extreme death metal but, to me, it’s extreme drumming. It’s a form of music that everybody should get involved in. I also try to motivate everybody to get involved in different styles. The metal guys play some jazz, funk and all that stuff. Also, the funk and jazz drummers play some metal. You kinda see the first version. I see a lot of metal drummers trying to get involved in different styles but not so much the opposite. I want to break this barrier and bring people toward music. Like I said many times, speed will always be mainstream. Some players say: ‘I like to groove but I’m not a big fan of speed’. I’m like: ‘Name your favourite drummers’. They name super fast guys. To me, Buddy Rich was doing what extreme metal drummers are doing today. It was super intense, super fast, aggressive. Of course, some lower dynamics as well, but there was a lot of aggression and intensity in his music. Tony Williams as well. You know, all these greats. Drumming is one thing for me. 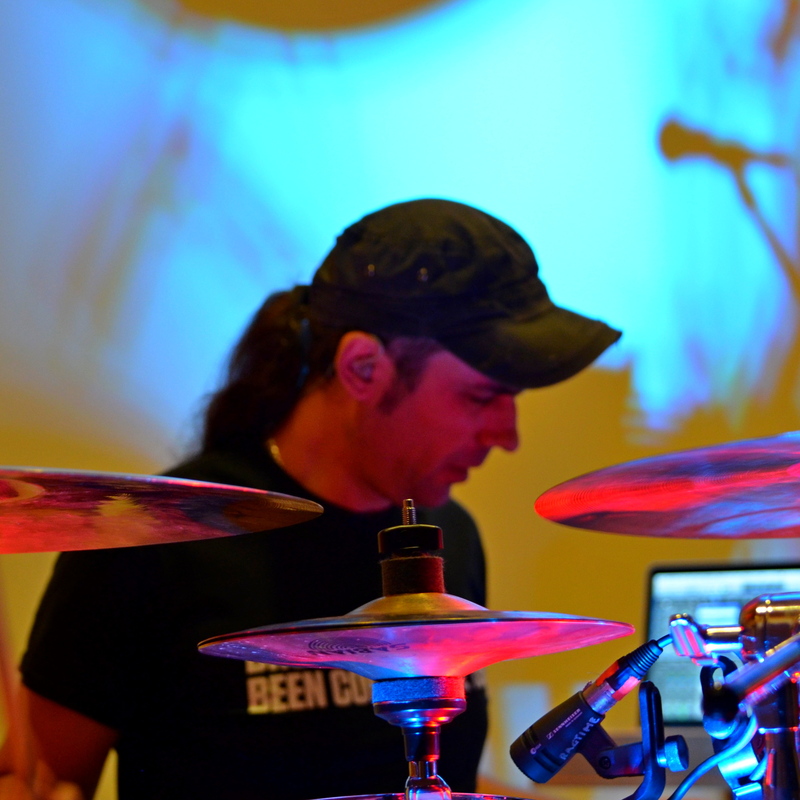 I try to motivate people and myself to play different styles, become a great drummer and have fun. I mean, it’s great fun to play different styles anyway. Daray and myself are involved with two big extreme metal bands [Dimmu Borgir, Nile] and we tour the world with them. This is why we’re well known but we don’t talk only about this specific style. Although, I try to introduce it a little bit smoothly. That’s why I do clinics. I do them because I really love drums, I can’t get enough and I try to show to people that this is not only a machine gun style. Sometimes, it has to be like that but the big picture is that it is drumming, it’s aggressive, fast and it’s a form of drumming that I do while I’m doing other things as well. We [extreme metal drummers] get a lot of blame about the trigger thing. They say it’s only about speed and stuff. To be honest, it’s our fault because I see many kids on YouTube excited about 250 or 300 b.p.m. This is stuck in their heads. When I try to explain to them that it’s not about speed, I’m not trying to tell them not to play fast. That’s what I’ve been doing since I was really young. I mean, don’t get stuck only with this part. It’s music and you should play fast if the music calls for it. It’s not a competition. We’ve said it many times. Although I support speed, I try to make people a little bit more flexible with other styles as well. I play Pearl drums. Pretty much forever. At the clinic yesterday, I had a Reference Pure. I own the exact same model back home. Right now, when I’m not using it as a big drum set, I use it as a fusion kit. Pearl sent me an extra 20”x18” kick and I use 10”, 12”, 14”, 16” toms. 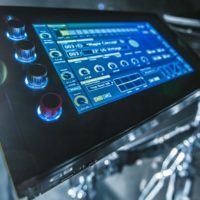 The snare is a Pearl Masters Premium Legend. To me, the Reference Pure is one of the greatest drum sets ever, one of the most successful recipes. I like the Reference but this is a little bit more open, it’s got a little bit more soul. Depending on the heads and the tuning, it can be used in many different styles. My Pearl Masterworks, which is my main big drum set in the studio, has got really thick shells and is more metal. It’s designed by me and I made it specifically for this style. The Reference Pure is pure fun. They should call it Pearl Reference Pure Fun. I love the kit! I have the same, natural colour as here. And I have a black kit. What a surprise! When it comes to snare drums, I also only play Pearl, seriously. I don’t have any other brand. 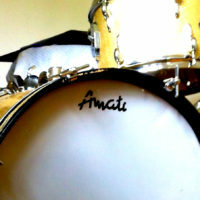 My Masterworks is a great metal snare. It sounds a bit weird and you never think it’s the best when you play but it sounds insane when recorded. I pretty much record with that when it comes to metal. The Reference Pure is for any style. The Masters Premium Legend has thin shells and is a little bit more open. Good for jazz or funk. The main Reference, the 20-ply shell, I use for rock. I’ve got a variety of snares but I’m not a collector but I do have seven or eight different snares which I use for different recordings because I do a lot of sessions for other bands. One of the great things when I have a session is picking the gear. Especially now that I have a new studio, I’ve got more room and I can use different drum sets and different setups. So with snares it’s like: ‘I’m gonna use this one or that one. I’m gonna muffle it a bit. I’m gonna make it more open’. Yeah, I’ve got a few snares to use for recordings. Now, on my Reference Pure kit, I have coated Evans G1. They sing a little bit more. When I teach on that kit, I use coated G2. You get the same vibe but they last way longer. On my main setup, I play Evans G2 clears. They’re great for rock and metal. Evans HD Dry on the snares, so a little bit more controlled sound. Evans EQ2 on the kick. It is double ply but a little bit more open. I love the open sound on the kick, I don’t like the choked kick drums. That’s pretty much it but I also have other models which I’m testing depending on the recording. Recently, I got the UV1 – a new drum head. They’re supposed to last forever. 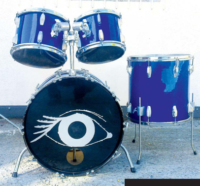 Actually, I saw a used drum head that had been used for five or six months and it looked brand new. Even for me, it’s hard to believe, you know. The sticks I’m using are Vic Firth. I’ve played Vic Firth since I first started, so I’ve been with them forever. Officially, I joined the family 13 years ago. I used to play the 5A, then, I switched to 55A because they’re a little bit heavier but still flexible if you want to play super fast. Five years ago, I was honoured to have my own signature stick. It’s based on the 55A with a barrel tip. I play really heavy cymbals, so I need something that lasts a little bit longer than the teardrop that they use on the 55A. The taper is also a little thicker, so it gives a bit more weight in the front. It’a great stick to play pretty much everything. It’s very flexible to play different styles. It’s not like it’s super heavy for metal and you gotta use other sticks for other styles. I like the idea that they have the same weight and mass in my hands when I’m playing. I don’t like to switch sizes so much. Having my signature makes some people think this stick made for metal, but it’s not. I challenge everybody to try my sticks. They’re gonna love them. I’m with Sabian. Also, for a long, long time. Yesterday at the clinic, I had to use some substitutes of what I mainly use ‘cause it’s really hard to travel around with my cymbals every time. I use mainly the HHX and AAX series. That’s my thing. But, again, it depends on the gig, the drum set and the setup. Recently, I switched from the AAX ride to the Leopard. I’ve just got a pair – 22” and 20”. They are pitch-matched. Amazing cymbals for what I do. I’ve got the same models in my studio. They have a little more overtone, so they help me with my sessions, if the band need a bit more of an open ride with a little more sustain. 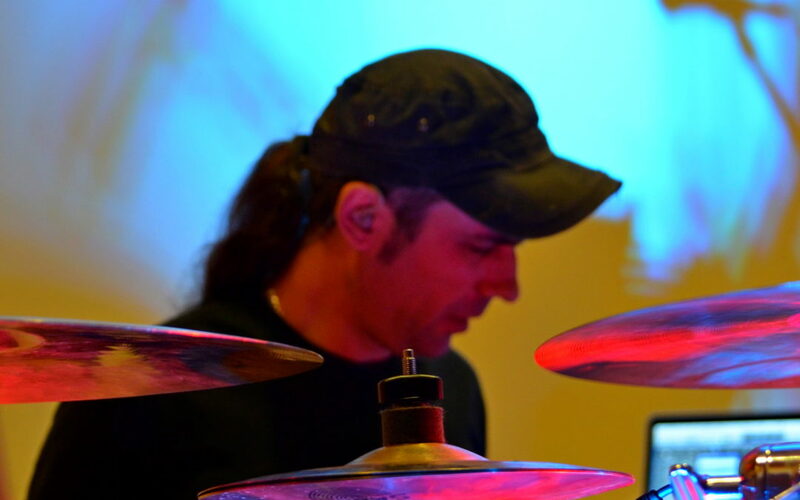 I also use the Sabian Dave Weckl Legacy series. I’ve got an Artisan ride for my small kit, Artisan hats, Legacy crashes. I try to use pretty much everything. I’ve used a lot of stacks in the last two years. Recently, I got the new XSR stack, which is 16” and 13”. What an amazing cymbal! I was blown away. I was lucky enough to have made a video when they premiered the cymbals. I love this one. Some 12” and 10” stacks as well. I use an 8” Aero Splash and an HH china. Whatever suits different gigs. When it comes to jazz, blues or funk, non-American drummers don’t really make it in America doing that kind of thing. It seems like an American thing. When it comes to extreme music, it seems like it’s the opposite. I can’t really explain it. I play in an American band. They could easily get an American drummer but we’ve been together for 13 years now. I don’t know. Maybe the Europeans were a little bit more hungry around 2000, when this scene kinda exploded. You would hear drummers go up to 250 b.p.m. It takes a lot. You really need to love the instrument and spend a lot of time. It’s not easy, I’m telling you. Every day I play, I have to go through pain. And you have to make it groovy and put a little bit more soul. People think it’s only the hard part, which it is, but there is also the musical part. If you only knew what’s in my head when I’m playing: the sound I’m producing, always try to keep up with the speed, of course, and always try to make it as clean as possible. Also, with Nile, it’s a lot of crazy time signatures. A lot. Like, 11s, 7s all the time. The thing is I can play 11 or 21. It’s OK. But at these speeds, you have to think super fast and it’s really tough to create a groove. But that’s why we play together. I love a challenge, you know.